The CBEI partnership was established to create solutions to address critical gaps in the market and to develop solutions at a building and regional level, which can be pushed out nationally with the support of market partners. This market accounts for 99% of all existing commercial buildings and approximately half of all commercial building energy use. This underserved market is challenging to reach because there are so many individual owners and the market is fragmented. The owners are often small businesses focused on business growth, and they lack in-house expertise to manage energy use and plan for energy efficiency improvements. However, energy generally accounts for a larger fraction of their operating expenses than for large commercial building owners. Building operational and equipment improvements are smaller in scope than for large commercial buildings, and therefore are often serviced by providers that are smaller and less likely to provide integrated, full-service solutions. Energy use improvements for buildings are more likely to be adopted if solutions are simple to implement. One simplifying approach is to have pre-proven technology packages for common building types and uses, making retrofits more standard and therefore less costly. This market sector is also better served by having automated solutions for detecting when systems are not operating properly and adjusting their operation to improve energy use. 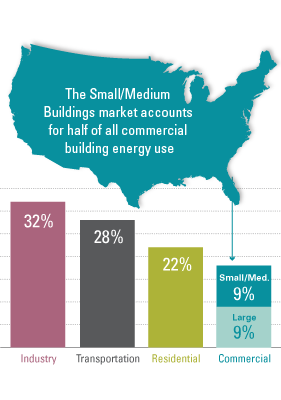 While building-level solutions are needed for this market sector, there are stakeholders in the market — primarily cities, states, and utilities — that have a strong influence on energy use in buildings this size. They influence or drive retrofits through carrots such as financial incentives for retrofits or sticks such as regulatory actions (e.g., building codes). Associations and other nonprofits and economic development agencies also are influential as trusted, independent entities that have non-energy missions but recognize the value that energy efficiency can have to smaller commercial building owners, such as how reducing energy costs can make regions more competitive. However, this diverse set of stakeholders is fragmented, often working in silos, even though they have similar goals. Adding to the challenge for retrofits in this market sector is the uneven level of understanding and awareness about energy efficiency solutions among all stakeholders — from the technicians performing the work to the building owners paying for services, to city or utility staff developing incentives, to those involved in real estate transactions. Education and training tailored to the roles of the individual stakeholders is essential to improving the number and quality of retrofits. The CBEI partnership was established to create solutions to address these critical gaps in the market and to develop solutions at a building and regional level, which can be pushed out nationally with the support of market partners. Taking a new energy efficiency solution from a concept to a common practice in the market is challenging. Too often the concept is formed — and developed — without input from the market on how the solution can best meet individual stakeholder needs. New solutions also often lack proof that they will work in a real world setting and not just a laboratory or controlled pilot setting, which adds risk — or perceived risk — for solution implementation. CBEI’s membership and approach to solution development, deployment, and commercialization was designed specifically to overcome these challenges. The partnership of world-class university research institutions, technology developers, and economic development agencies brings a diverse set of capabilities and perspectives that CBEI integrates into innovative systems solutions for the commercial buildings market. CBEI’s research approach is based on overcoming the fragmentation in the market by continuously engaging with a diverse set of stakeholders to develop easily implemented solutions. CBEI structures its research to ensure continuous market engagement from problem identification through solution deployment and commercialization. Researchers draw on the extensive market networks of the Consortium partners to identify and engage before, during, and after each project. 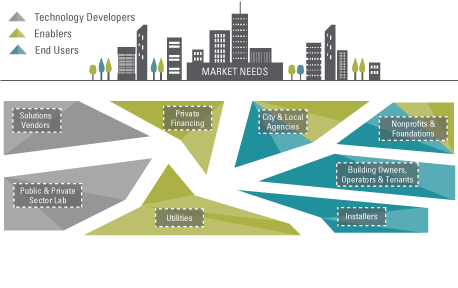 This allows solutions to be shaped by input from critical users of the solutions, including building owners and operators, tenants, retrofit service providers, state and local governments, and utilities. Close involvement of these end users ensures that solutions have greater potential for deployment in the market, since the users have helped shape the solution in a way that makes it easier for them to implement. CBEI has had substantial success with market uptake of solutions as a result of this market-oriented approach. There is no lack of commercially available solutions that can reduce building energy use. What is lacking are the approaches and tools necessary to combine technologies and provide the training and market incentives in a way that maximizes their potential — making the whole stronger than the sum of the parts. 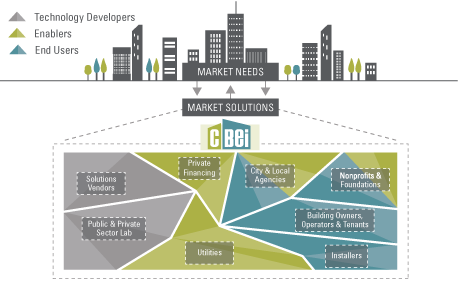 CBEI’s approach to solutions in the market is to take a systems integration approach, where teams of multidisciplinary researchers — engineers, architects, economists, human factors scientists — work together to identify and test solutions to create combinations that improve building energy performance, indoor environmental quality, and return on investment. Owners/operators tend to be risk averse. They like using approaches that have been proven to be cost effective in an existing building, where the operating environment is more realistic and not controlled like in a laboratory. Without knowledge about how reliably a solution will perform in a real building, retrofit service providers also are unlikely to recommend a solution. Demonstrations in operating buildings reduces deployment risk. However, real-world demonstrations are difficult to set up and manage, and therefore are not often used to prove performance of newer solutions. Even when real-world demonstrations are utilized, the information is often not readily shared. As a result, newer solutions are harder to get into the market. CBEI has developed a robust capability for performing real-world demonstrations. The Consortium has performed demonstration activities in 28 commercial buildings, covering a wide range of end uses and sizes. These include testbeds with multi-measure testing capabilities and sites identified for testing specific technology types. All of these buildings are operating for their primary purpose (e.g., restaurant, office, retail), and CBEI has established strong working relationships with the owners/operators to allow for technology demonstrations during business-as-usual for the building owner. These demonstration sites have been used over the last five years to refine and prove multiple technologies, technology packages, and processes such as advanced controls and diagnostics, building energy systems, and integrative design processes. CBEI develops case studies from the demonstrations and pushes these out through its partner network and industry journals and conferences. Recognizing the gap in the market for helping new technologies achieve commercial scale, CBEI established a commercialization center, in collaboration with the Department of Energy, Small Business Administration, and National Institute for Science and Technology, Economic Development Administration of the Department of Commerce, and the Commonwealth of Pennsylvania. The CBEI Commercialization Center focuses on supporting commercialization and deployment of advanced energy retrofit-related products and services. The Center provides an integrated suite of programs and services to entrepreneurs and established companies. Services include helping with business plan development, market assessment, connections to design engineering and prototyping firms, marketing, and support to non-local and foreign-based companies to expand into the Philadelphia market. The renovated CBEI headquarters serves as living laboratory, featuring numerous energy efficient features and systems and built-in monitoring designed to facilitate research in energy efficiency and building-to-grid interactivity.